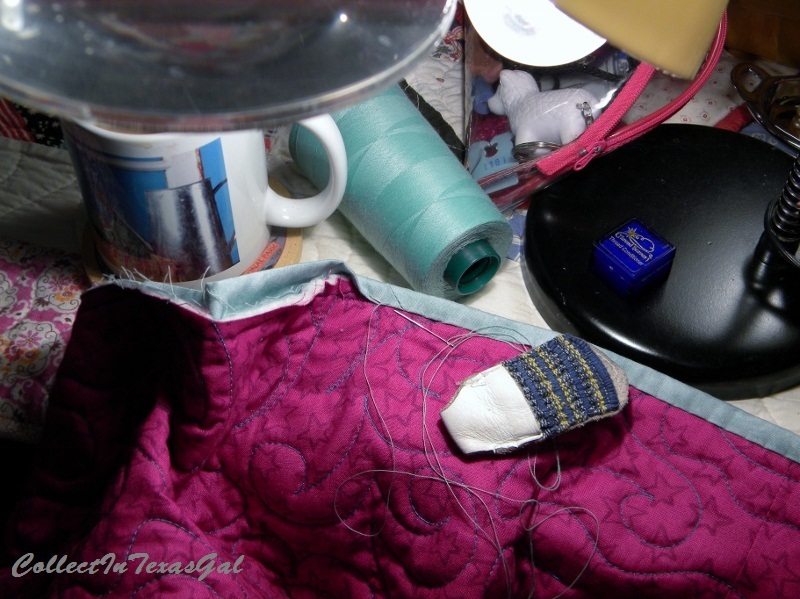 Sewing fills my days, not to mention the living room, bedroom and closets. So much fabric, so little time! 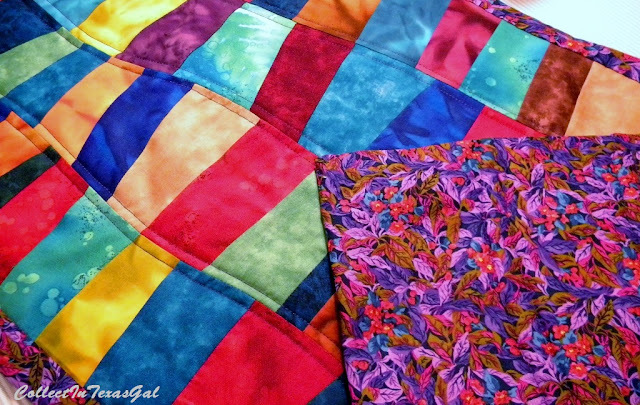 Or, sew much fabric, sew little time! I'm a Material Girl...want to see my fabric collection? AuthorsUnknown...could be me...how about you? As a Collector of Needlework, I am always on the look-out for OP-UFO's (OtherPeoplesUFO's). when I find one...I can not leave it behind....like I don't have enough UFO's of my own. Like this beautifully done, tiny stitched, cross stitch sampler....which I do not do...cross stitch. 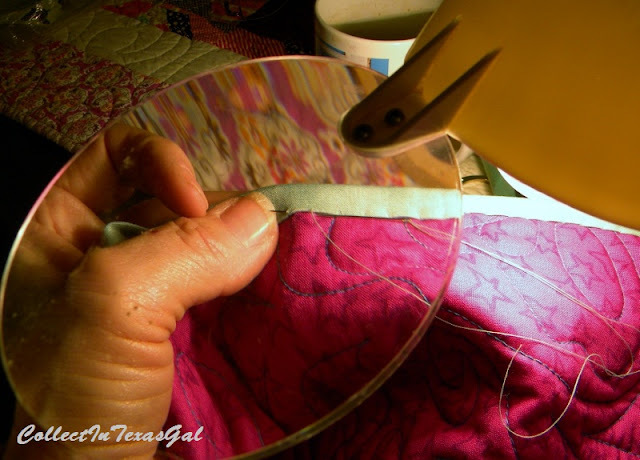 to do such tiny stitches that I'm sure require an 8X's magnifying lamp and the patience of Job. With that said, my forte' is 'SueToThe Rescue'. Yep, LOVE Finishing OPS...OtherPeoplesStarts! 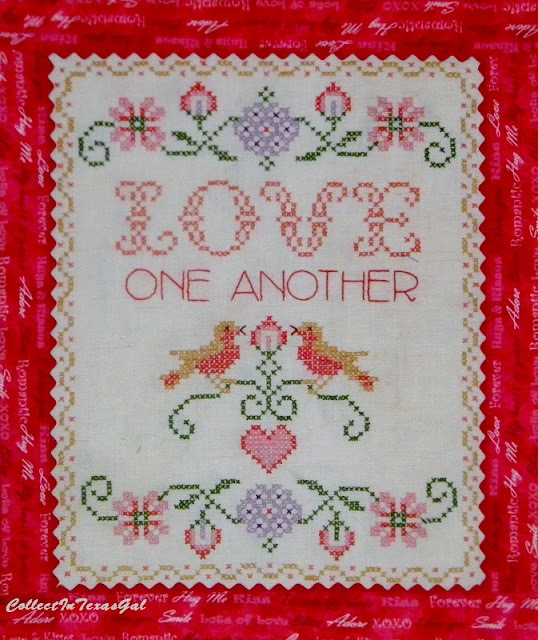 So here is the Start of Finishing this LOVE CrossStitch Sampler. 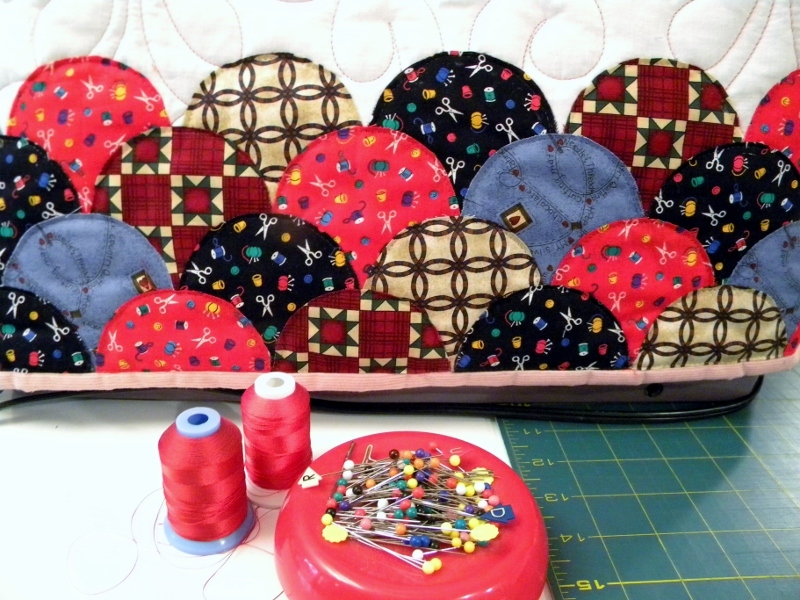 Round one is RedRickRack precisly placed around the Red and Gold IttyBitty X's. 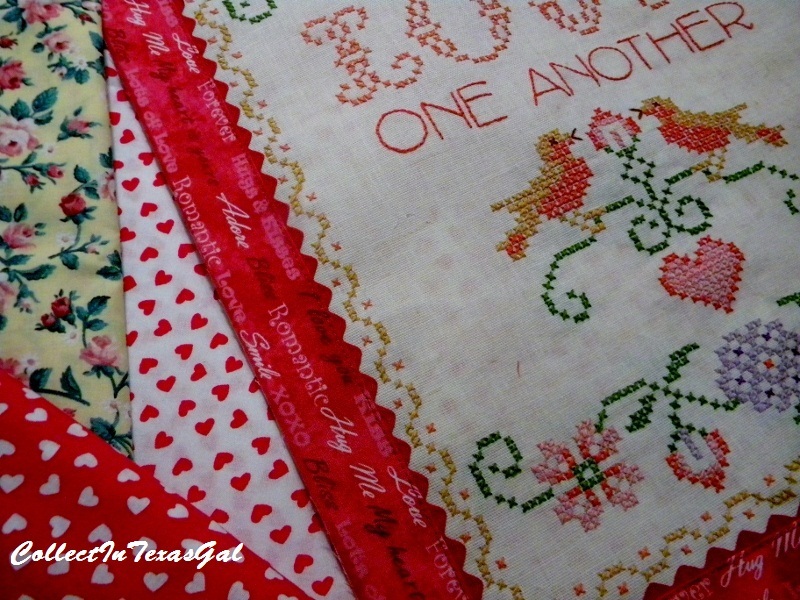 Roxanne's Glue Baste so I could 'TopStitch' the 'LoveQuip' inner border. I do LOVE the way this is working out. possibly even get a SMILE for Round 3. 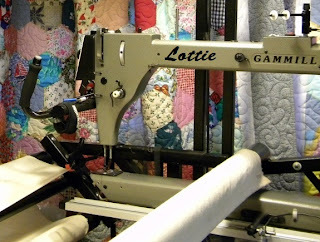 It's Official....I am now a HiTech Geekette Sewist. the latest HiTech gadget to have, and I had it on my Heavy Metal Kenmore. that it's YEARS past that 'FarFetched 2001'....how GNCA is that???? to now stitchin' on your Computerized Janome 6600. 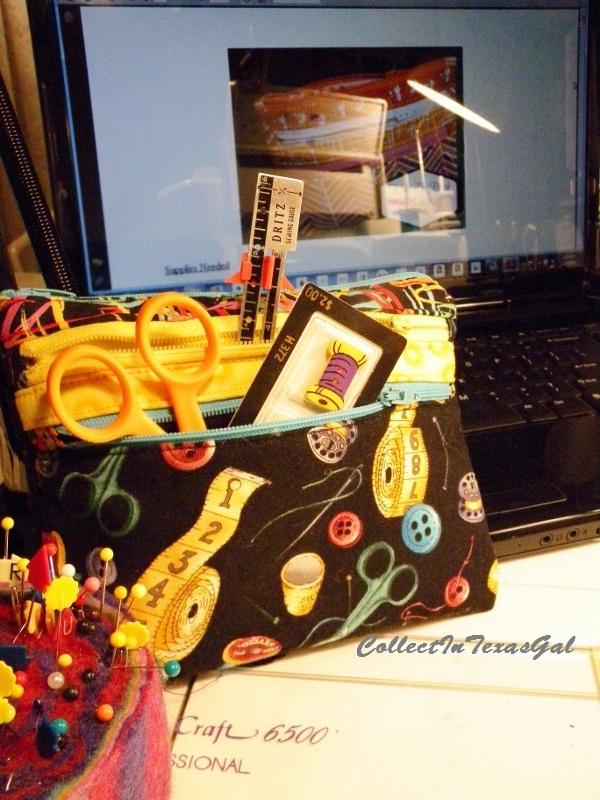 Here's my TripleZipper Sewing Bag...result of 2013 Space Odyssey Sewing. Thanks Deb for the PDF. 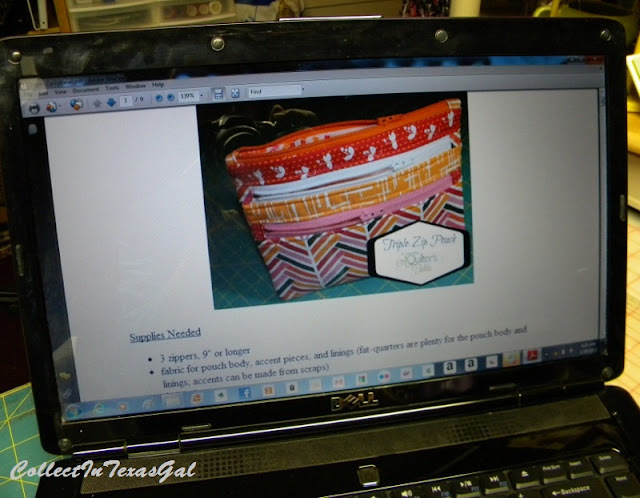 I don't know what PDF stands for, but it sure was fun 'Triple Zippin' Along with You! 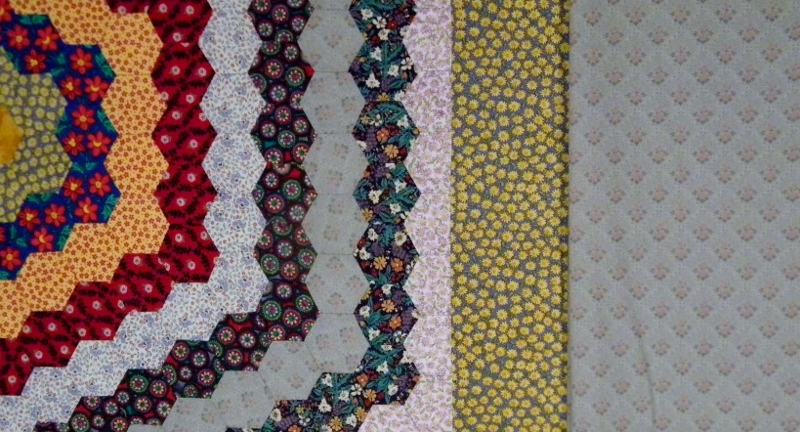 Grandmother's Flower Garden pattern was popular in the late 19th Century, and hit it's peak of popularity about 1925. 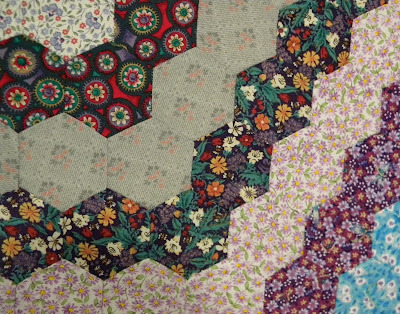 This block was popular during the Depression when quilt making was almost a necessity, as women were forced to return to frugal homemaking once again. The hexagon provided a way to use small fabric scraps, and was cheerful reminder of colorful flower gardens, a much needed lift during hard times. The number of hexagons in the finished quilt and their size were a matter of pride for the quilter. 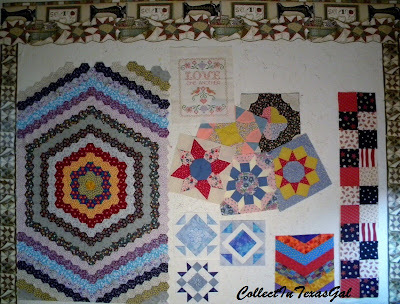 As a collector of Vintage Quilts, I have to say that the 1930's Fabrics and Patterns are my Favorites. 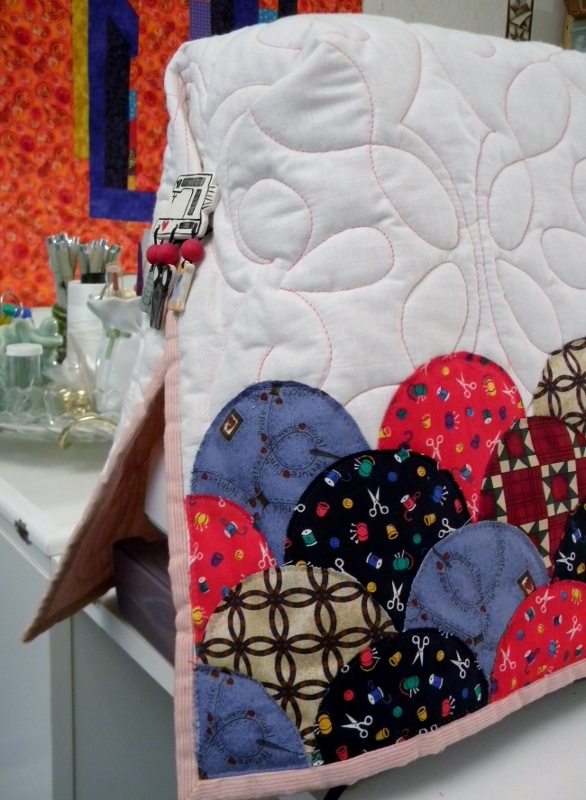 Over the years I have restored, remade, repurposed, and quilted many Vintage Grandmothers Flower Garden quilt tops. This Flower Garden was a rescue top that had several holes and torn places right in the middle of what was made to fit a full size bed. I repaired what I could and then cut the top into FOUR smaller pieces. 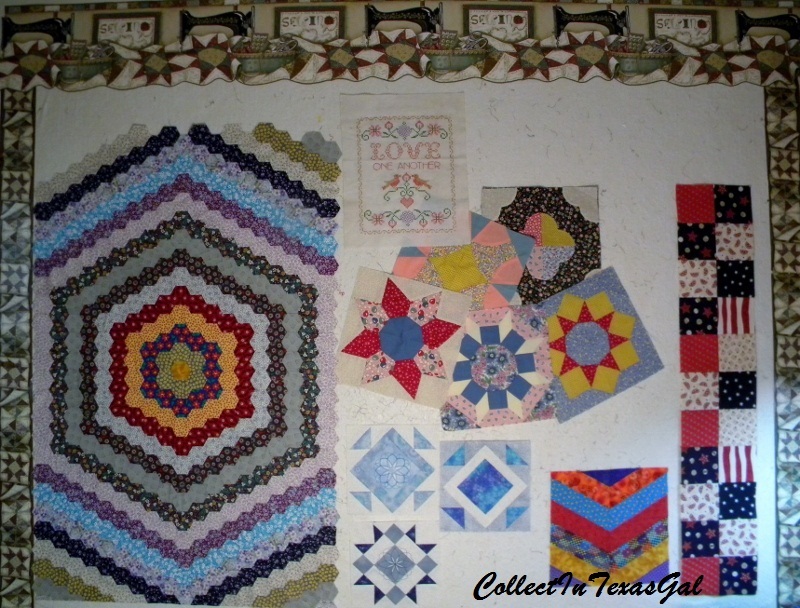 Added new 1930's reproduction fabric borders and backing then machine quilted them. Although, not an easy pattern to machine piece, it can be done. 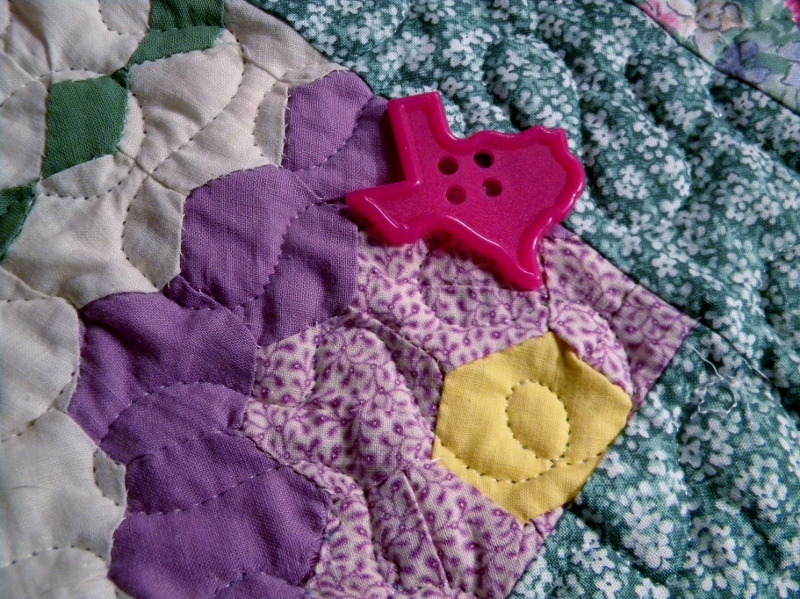 Traditionally it is pieced by hand. 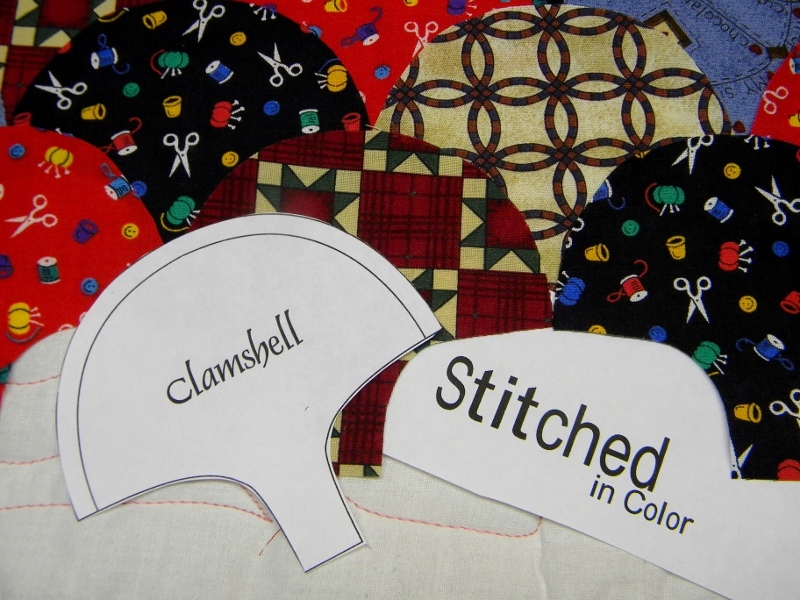 Today there are several techniques that make the hand piecing, cutting and marking a bit easier and quicker. English Paper Piecing, Plexi-Hexagon Templates, and my often used method...Stamps by Kate...which I discovered at the Houston Quilt Festival one year. 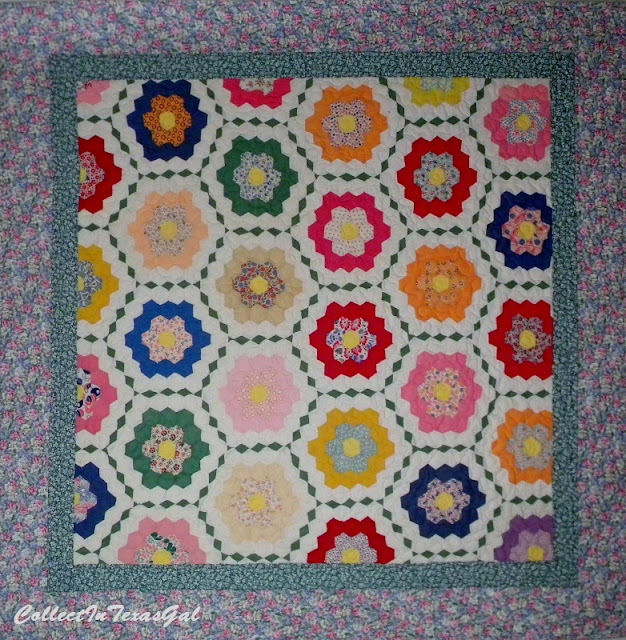 I picked cut flowers in this Flower Garden Trip and planted a lovely border all the way around. 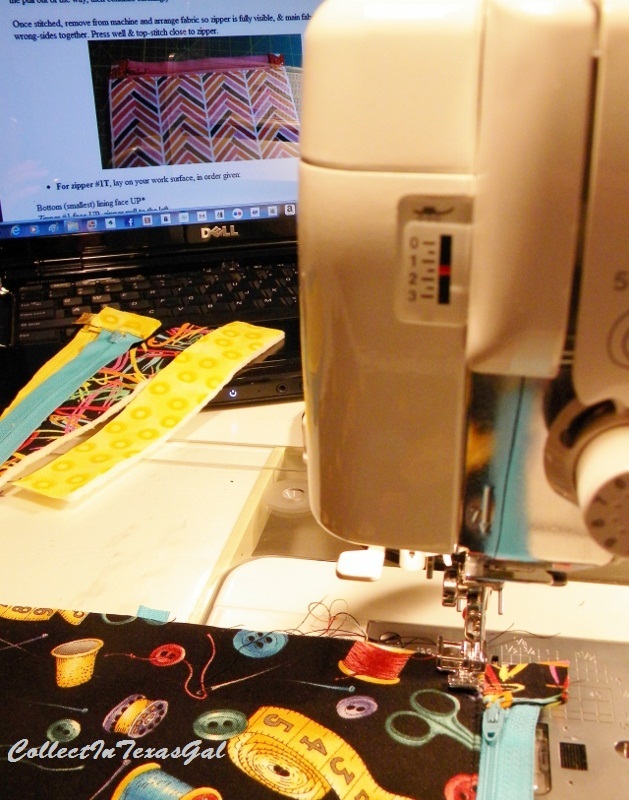 there's no time like the present....or when it's Friday Night Sew In time. but my Seed Stash of matching pieces must have been used in another Scrappy Garden Quilt. On to Plan B....clipped off the tops ends and planted a border of tiny yellow daisies. 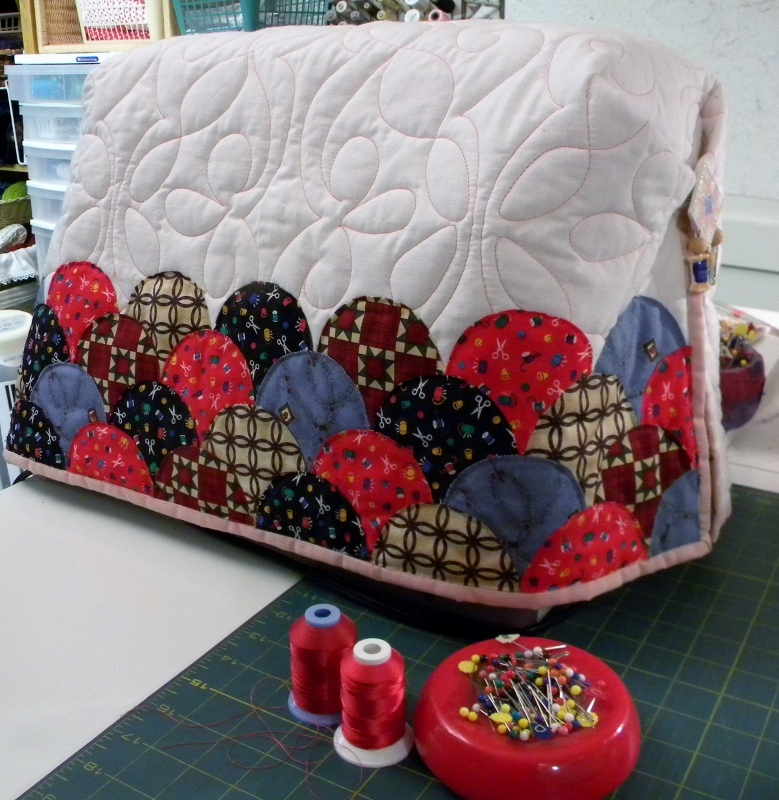 Lucky for me the Seed Stash had two yards of just the right matching fabric for backing. 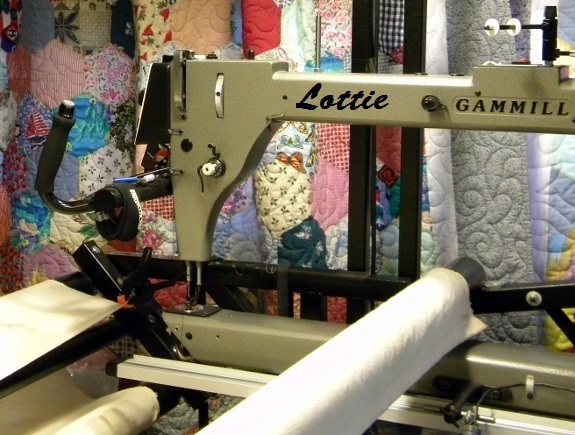 It's all pressed and both pieces are in Lottie's Line. 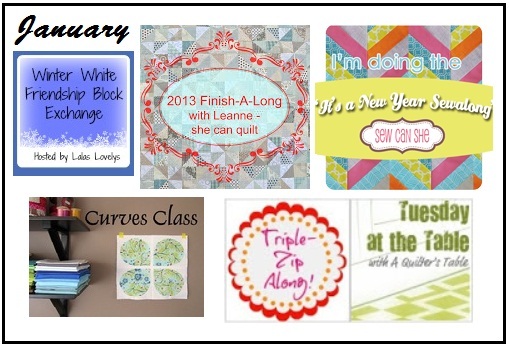 FinishAlong Projects for the First Quarter which ends in April. so long as it doesn't get bumped back in *QuiltALottie's Line. Grandmother's Flower Garden is one of my All Time Favorite Old Fashion Quilt Patterns. 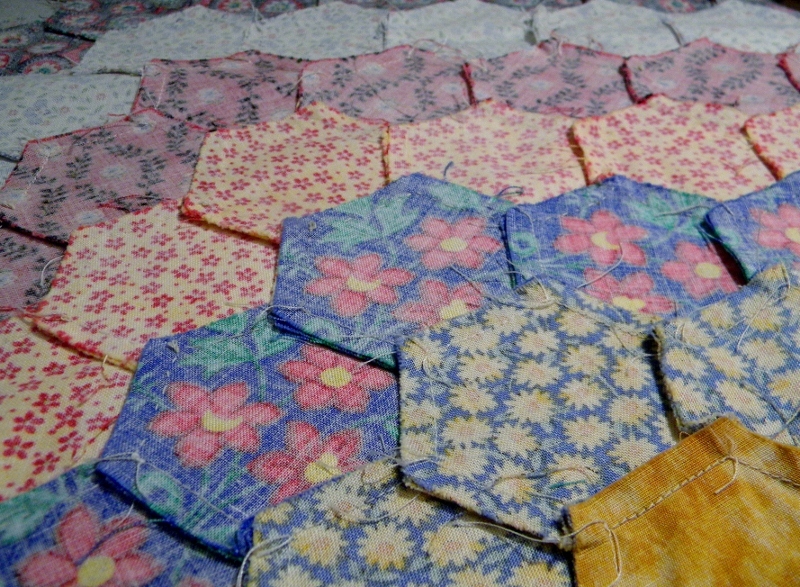 Once I learned the technique of piecing YSeams, piecing the Hexagons together was easy. 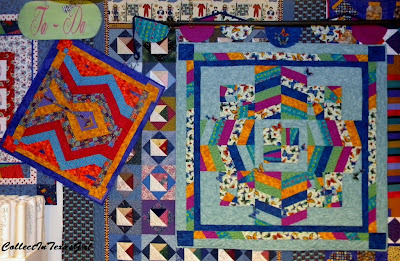 I enjoyed piecing both by hand and on the machine. A helpful Tip...PRESS the Back after each round. And...cut more HexieSeeds than you think you'll need...or...finish your planting in one season! 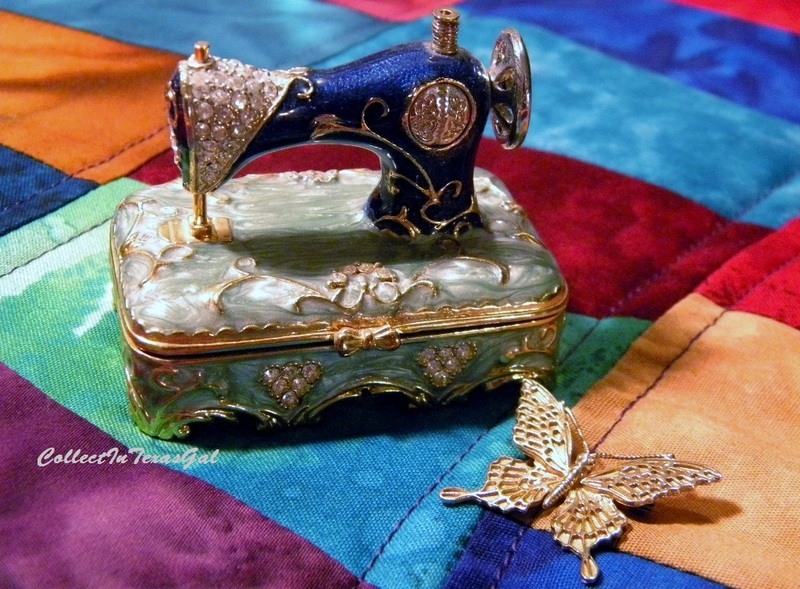 If ever there was such a thing as 'Stitching Bling'...I have it in this Bejeweled Miniature Sewing Machine Jewelry Box. A very special and Favorite Thing...a gift from a very special and favorite person...my Sister. If ever there was a such a thing as Fabric Jewels...I have them, too. 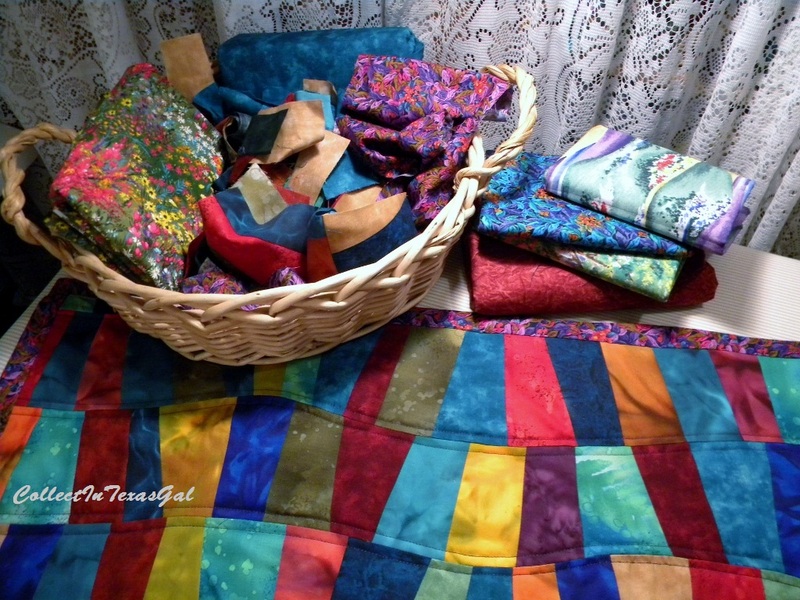 They are called Batiks and Marbles and when pieced together they truly sparkle and shine like Jewels. I just finished this BeJeweled Table Runner. 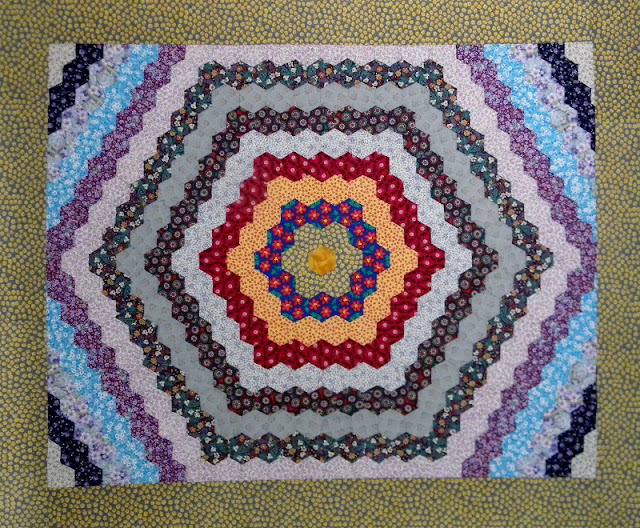 It was an Improv Curve Project in an Internet Class I'm taking with Rachel at Stitched in Color. Improv means you Rotary Cut Freehand (without rulers) and stitch the curved pieces without pinning. Kind of like 'Flying by the Seat of Your Pants'...I do that alot...so this was right up my Improv Alley. I ImprovCut a basket full of strips then pieced them in pairs...then in fours and so on until I had four strips long enough for a Table Runner. The real ImprovCuts came when Rachel said to overlap the strips and Freehand Cut two strips following the gentle curve made by piecing angled strips together. Yikes...it was kinda scary even for an 'Experienced Pants Flyer'. I loved it...can't wait to slice up some more strips to add to the leftovers and start again. 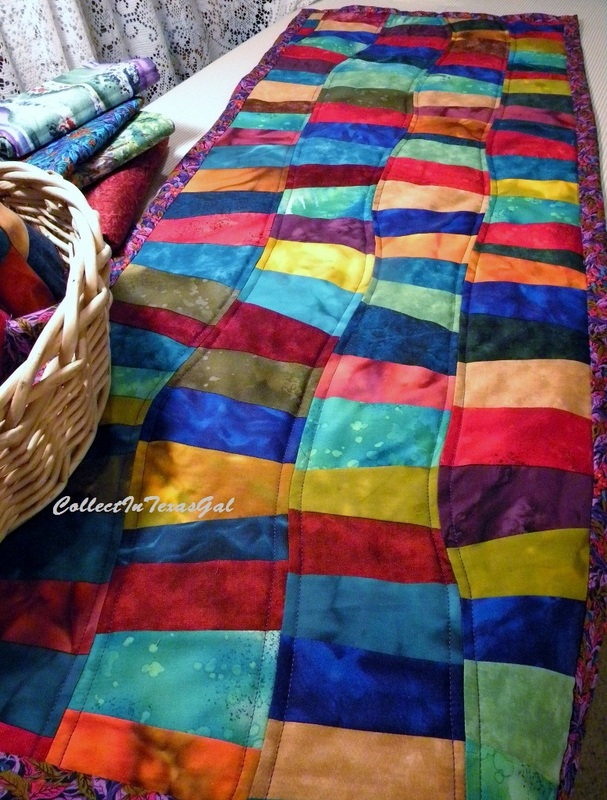 I see an Improv Curve Bed Quilt in my future. I'm really lovin' this Jewel encrusted table runner. I'm thinking I need to have it insured. two dozen Rubies, lots of Citrine and I don't know how many Emeralds. Oh, and the backing and binding....rich as can be...don't you agree? 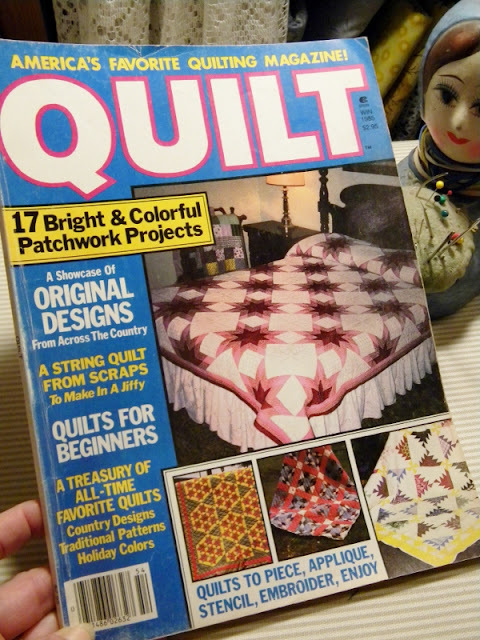 I wasn't a Quilter during the Winter of 1985, but my MotherInLaw was a Quilt Magazine Collector, and I'm guessing she was thinking about becoming a Quilter. She was an experienced seamstress with many years of dressmaking for herself and her daughters. 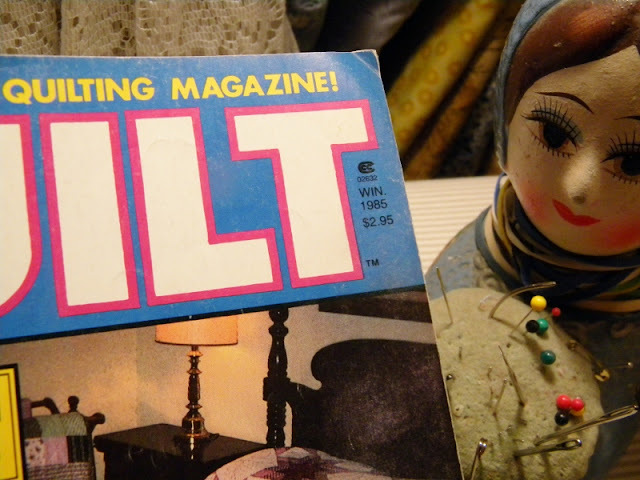 She had the largest collection of 'Polyester Double Knit' this side of Dallas. One day, around 1995 or so, I was telling her about my Quilting Lessons at the Senior Citizens Center...that story HERE. 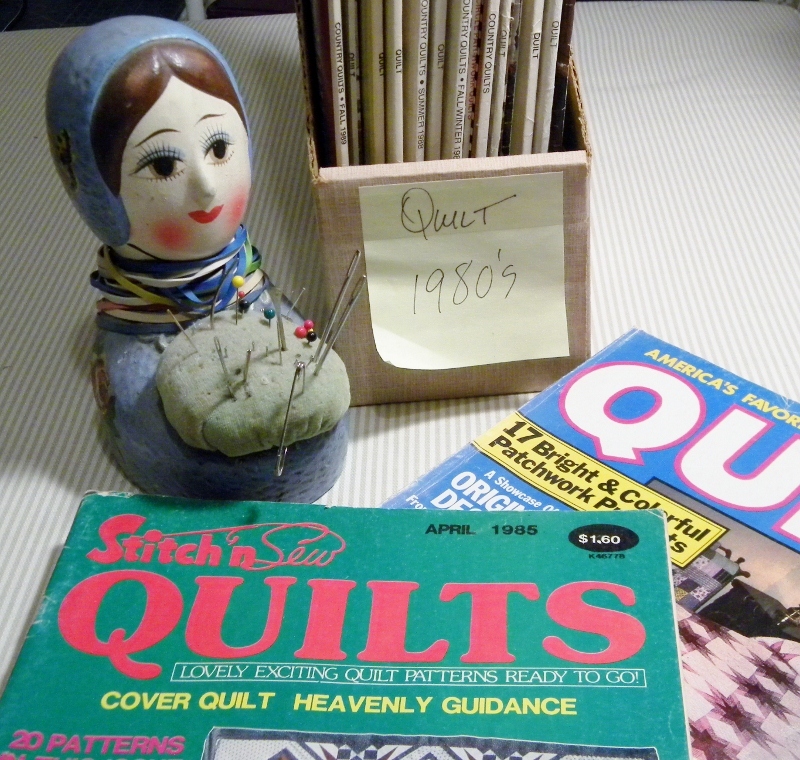 We were sitting at the kitchen table drinking IceTea and talking about sewing and fabrics...again double knit...when she remembered her Collection of Quilt Magazines. It took her a few minutes to find them in 'The Closet' where she kept 'Things for Later'...you know special stuff saved for a 'Rainey Day'. 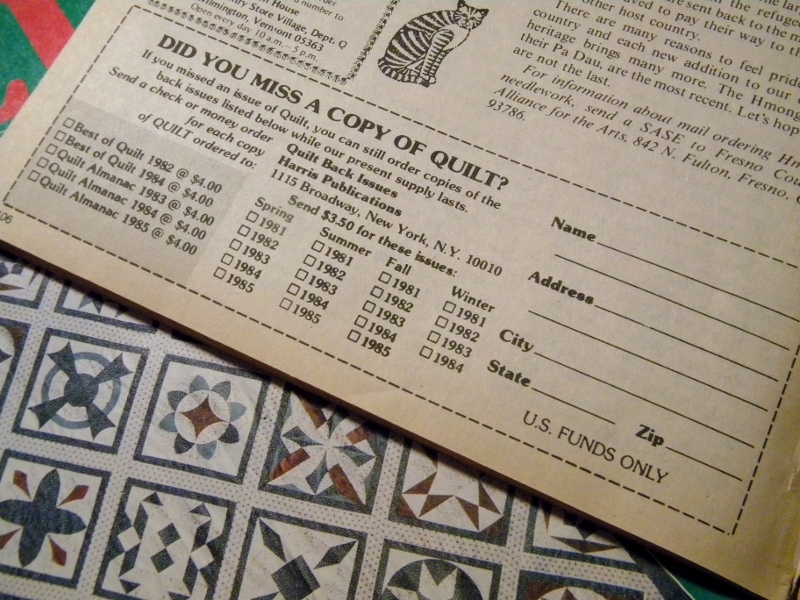 That was the beginning of my Collection of 1980's Quilt Magazines. 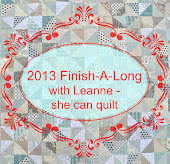 my MIL thought it would be perfect for a Beginning Quilter. 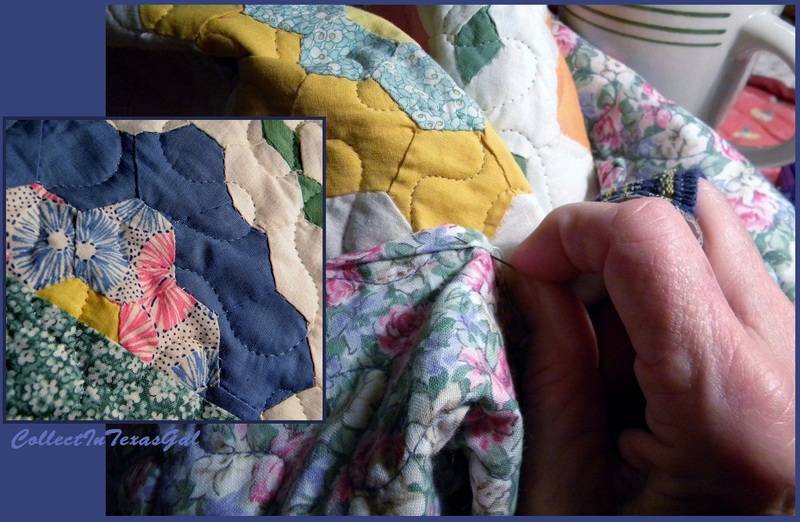 Memories of SweetTea, Kitchen Table Visits and my MIL Ruth. CoverUp...What a versatile word, and one that relates to a variety of situations/events/objects. These days we are all familiar with the 'Scandalous CoverUps' in the news. Then there are the SwimSuit CoverUps that don't really CoverUp much, and could be viewed as Scandalous. I personally am part of the CoverGirl CoverUp. Oh, and I absolutely am on board with all the Warm CoverUps like sweaters, scarves, and shawls. Even Victoria's Secret claims to have a corner on the market of CoverUps....again...not much covered there. Back in the 1980's there was a TV Series called CoverUp starring Jennifer O'Neill. Of course there is a book entitled 'CoverUp'...noticed it on Amazon. Personalize Your Gadget CoverUps...iPhone, iPad, Galaxys, and more. Here's my GADGET that needed a CoverUp. 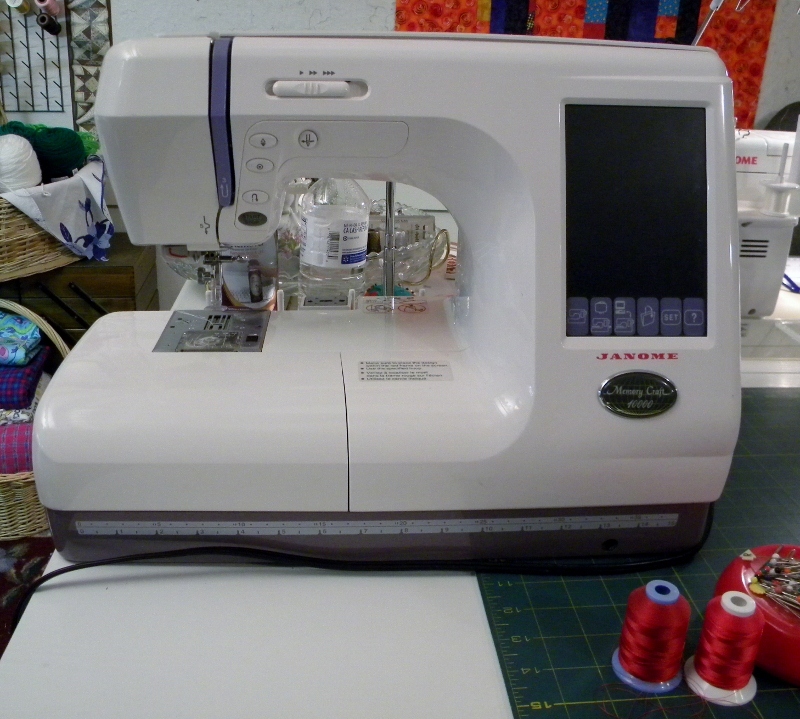 It's my Funky Shaped Janome Embroidery Machine...narrow at the back and wide in the front. take down the Multiple Thread Holder Thingy...you get the picture. Now She's Covered and happy as a Clam..or at least I am. A perfect solution to the Funky Shape...A Fold To Fit Sewing Machine Cover! 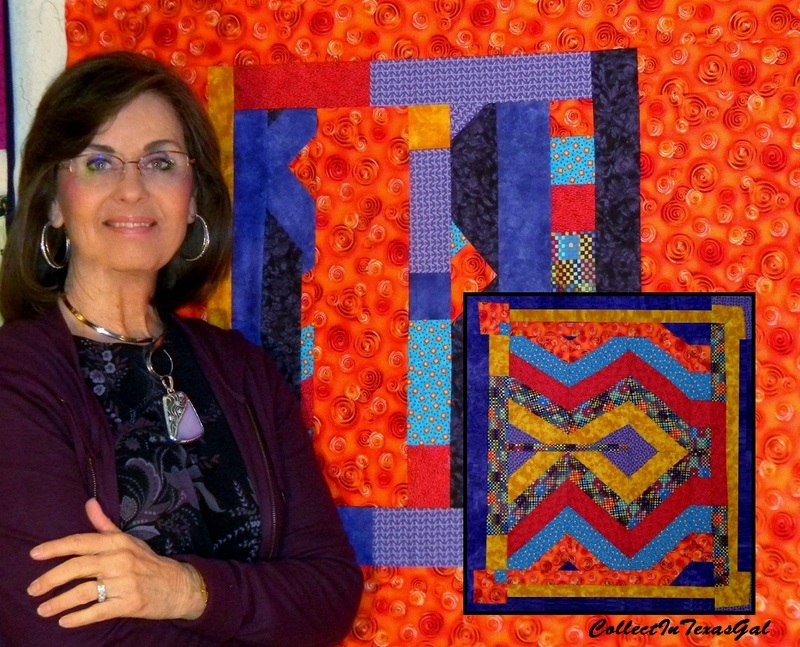 The Clam CoverUp is made from a LongArm Pattern Sampler made years ago for customers to see how a pattern would look stitched on their quilt top. I have lots of these samplers, and it was just the right size to stitch the clamshells to. The Stitchin' Fabrics are from my Sewing-Quilting Theme Stash, and the Clamshell pattern from Rachels Curves Class. Don't you just 'Heart' the Sewing Machine Pin? Soups On, Ya'll...Clam Quilt Chowder Soup that is....and I didn't even have to 'Dig the Clams'. Which is certainly a good thing since Clamshell's are hard to find here in West Texas. Lucky me to be taking Rachel's Curves Class. Yep, I 'Downloaded' instead of 'DugUp' the Clam Pattern. 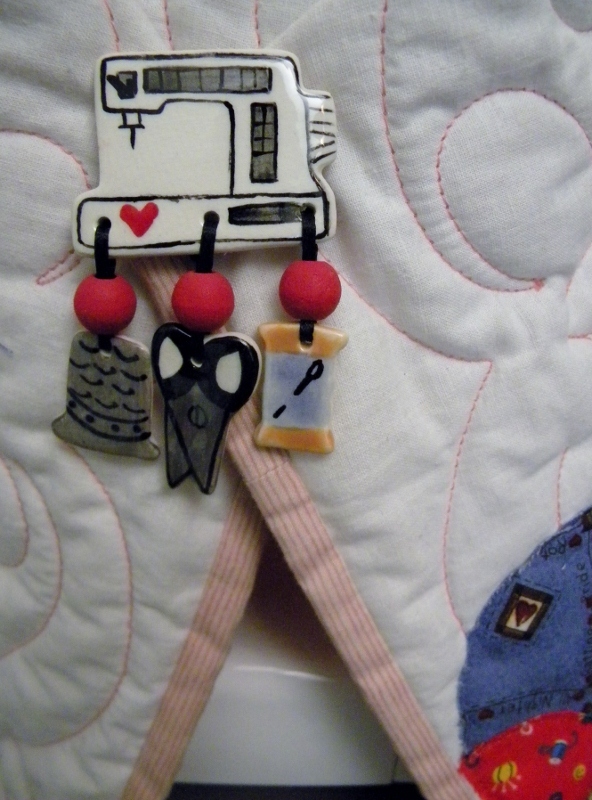 and adapted the Pillow Cover into a slightly different Cover...to be revealed later. them in place while you are stitching them. 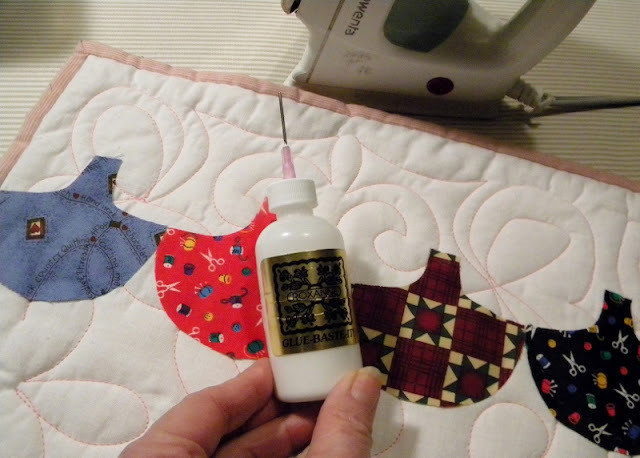 I used Roxanne's Glue Baste-It....love this stuff....a dot or two is all it takes...heat set then stitch! 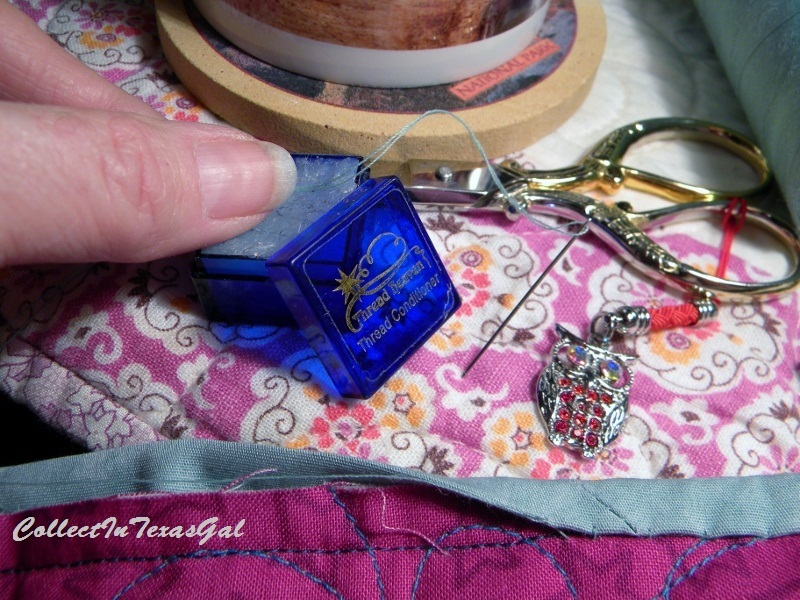 No fuss...No Mess...No Sticky Needle...No Worries!!! The stars are aligned for brilliance today, Aquarian Sue...it's your time to shine. It's as if you've tapped into some universal electrical current. At that point, you seem to develop a bit of a blind spot. But this is one of those times it's important to keep within the limits. Let your Creative Genius Bloom! Forget the Rules and Regulations! And to hell with the Framework of Protocol....It's my Birthday! Much Ado has been made about 'The Right Stuff'. 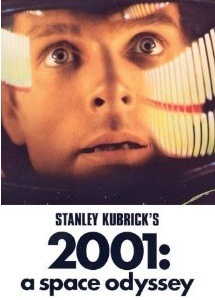 It's a Book...It's a Movie...It's a Song! A Cup of Coffee...A Leather Thimble...Needle and Thread...and TWO Favorite Things! but especially for stitching down binding. 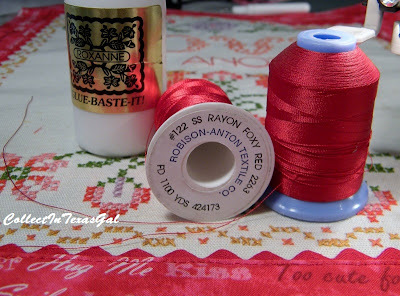 It conditions your thread and makes it slide through fabric without tangeling and making knots. It's easy to use and lasts and lasts and lasts! 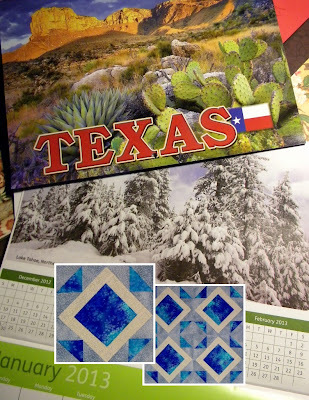 Look for it at your Local Fabric Shop or order it OnLine...Link at bottom of this post. MAGNIFYING LAMP...It's soooo the Right Thing for 'Proper Lighting' and 'Saving Sight'! Mine is a Thrift Shop Find many years ago. for you OnLine...Link at the bottom of this post. 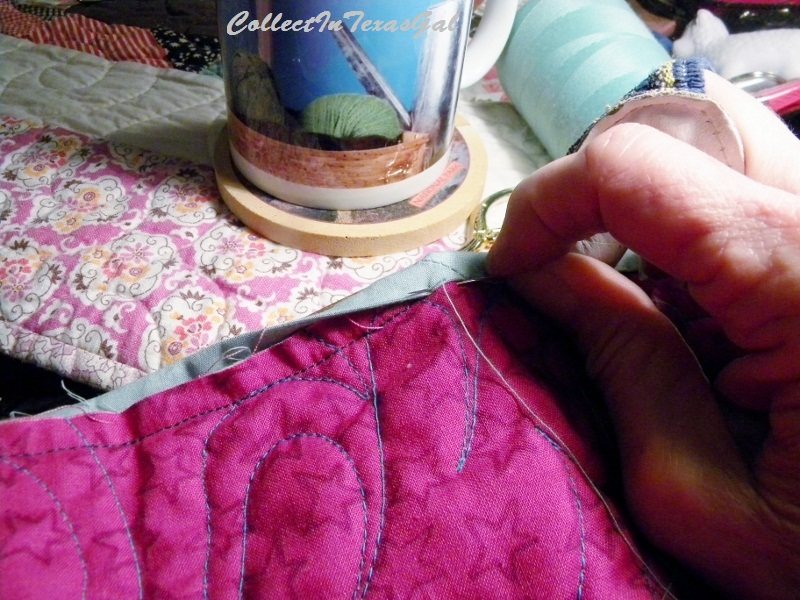 SewAlong Butterfly Bundle Quilt and my Coffee. Don't you just love reading 'Quilting Stories'? FINSH ALONG 1st Quarter...Let's DO This! !